You may remember that Week 4 saw me beginning a truly beautiful blanket. I was really happy with the way the colours were working together, but for some reason the blanket itself would not lay flat no matter how much I tried to force it to do so. After a chat with Jen, the font of all wisdom when it comes to crochet, we decided that my technique is just not suited to the pattern as it was written and instead of spending hours trying to make my technique fit it would be far easier (and quicker) to start again. So, with a slight sadness, I took the blanket apart and started anew. This in itself caused quite some conversation amongst non-crochet friends as I announced that I was "frogging" my blanket and they thought I had gone mad! 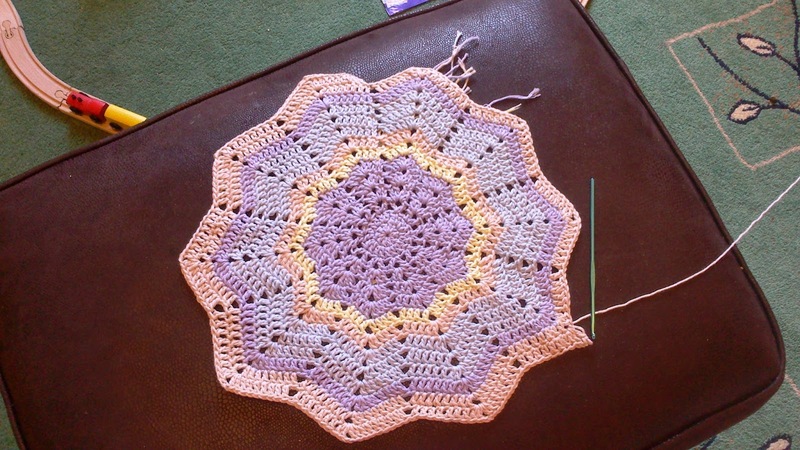 Frogging is a term used in crochet circles to describe the act of taking out stitches to correct a mistake. Please don't ask me why this term exists because I honestly don't know. But I like it so I'm going to use it. I'm going to have to start laying it on the floor and standing on a chair to fit it all into one shot! It may look like I haven't made much progress since last week, but remember I started again and have done all those rows in this past week! I've discovered that when working on a blanket I am better combining my 10 minutes a day into 2 or 3 longer sessions as that way I can really get stuck into it. As the blanket gets bigger, each row takes that much longer to complete and so it is nice to sit down for an hour or two at a time and really add to it rather than making tiny additions that the odd 10 minutes here or there would allow. I love working on blankets as there is something very soothing about it. There is the added bonus, of course, of knowing that the blanket will be truly treasured. As I work on this one I can't help but wonder who might buy it and which beautiful baby will be wrapped in it. Will it be an HG baby? I remember making several blankets while pregnant with Oscar and receiving two crocheted blankets from friends as well. Having them to hold on to whilst going through one of the worst times in my life helped to remind me that I was doing it all for a reason and that there would be a baby at the end of it all. I hope that maybe this blanket will also bring that same comfort to someone else. So with that thought in mind, I am going to leave you so that I can continue working on the blanket itself! Don't forget you can sponsor me at BT Donate or buy me a gift card via Black Sheep Wools so that I can keep my yarn stash full for all the projects I have planned.